Southwestern breakfast crepes stuffed with Southwestern salsa: black beans, corn, tomatoes, bell peppers, cilantro, and topped with eggs! 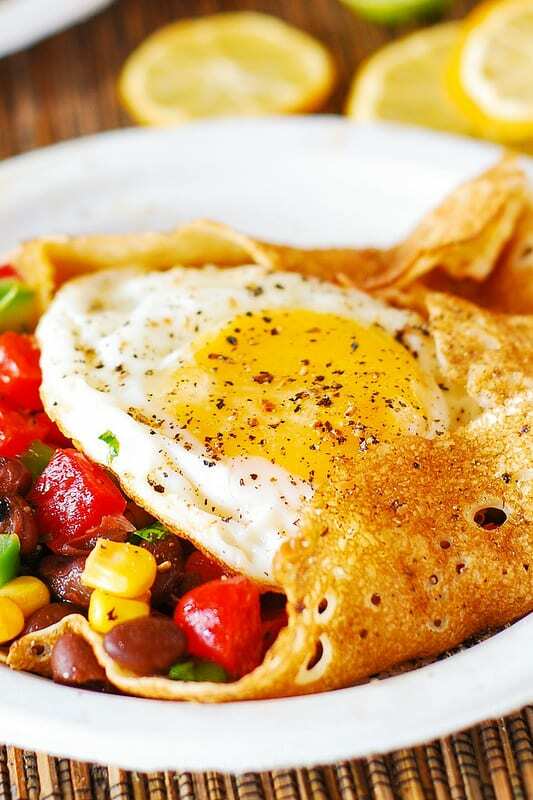 A delicious way to have a light and skinny and yet filling breakfast is to make some thin crepes and fill them with homemade Southwestern salsa, and then top with an egg! You get a little bit of everything in this recipe: some carbs, protein, lots of fiber, vegetables. These breakfast crepes are low in fat and calories, and yet are very filling thanks to all the fiber and the eggs! I provide detailed instructions on how to make crepes in this post. If you want to make these breakfast crepes gluten free, I also have a recipe for how to make gluten free crepes. 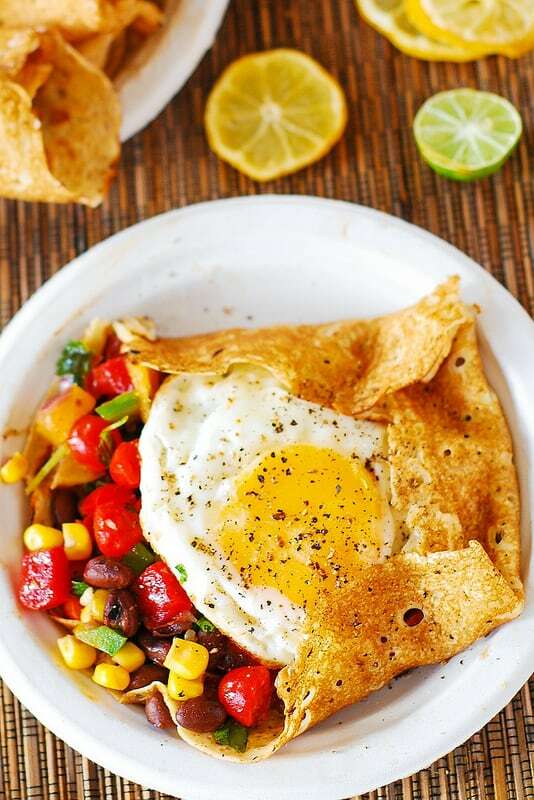 Fry the eggs only after the crepes and Southwestern salsa are ready to keep eggs fresh and warm. You can warm up the crepes and the salsa before final assembly and serving, or you can serve them at room temperature. 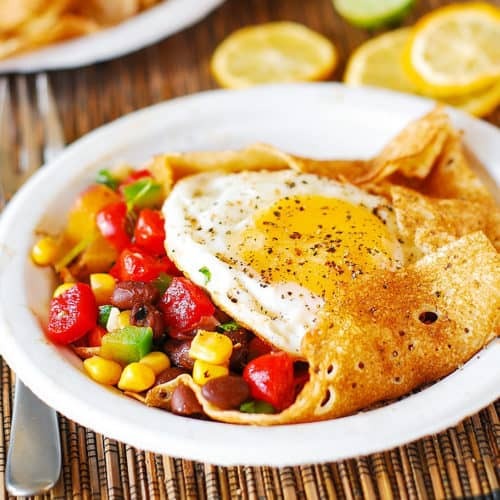 Southwestern breakfast crepes stuffed with Southwestern salsa: black beans, corn, tomatoes, bell peppers, cilantro, and topped with eggs! You'll love these vegetable stuffed crepes! Make classic French-style crepes according to this recipe. Or, make gluten free crepes according to this recipe. In a large bowl, mix black beans, yellow corn, chopped tomato, chopped bell peppers. Add lime juice and salt and pepper to taste, mix well. Set aside to let the juices combine together. Grease a large skillet with cooking spray, and heat the skillet on medium heat until hot. Crack each egg and pour onto the hot skillet. Depending on the size of the skillet you may fry from 2 to 4 eggs at the same time. Do not overcrowd the skillet. Cook until the whites of the eggs solidify and the yolks remain medium-rare. Using a wide flat spatula, transfer eggs onto the plate. Note Make the eggs only right before you are ready to assemble the dish (that is, after you made crepes and the Southwestern salsa), so that they don't get cold. Place a crepe on a plate. Put some Southwestern salsa (you can warm it up or serve it at room temperature) on one half of the crepe. Top with a fried egg. Fold 3 sides of the crepe inwards to form a half-closed, half-open pocket as on the photos. Note: the cooking time does not include time to make crepes. It is assumed that you already have pre-made crepes before starting this recipe. I want these for dinner! Is that okay even though they’re called breakfast crepes? They look delicious Julia, so vibrant and fresh, yum! This is one of those healthy breakfasts that I’m sure doesn’t taste healthy at all! Looks wonderful! Julia – this is such an ingenious way to enjoy one of your fabulous crepes – thanks so much, I don’t think I’ve ever had a crepe with salsa and an egg! These are going on my menu this week! You’ve sold me! I can’t think of a breakfast I’d enjoy more. I cannot think of a better way to start off the day! What a delicious dish! This is not only delicious, also nutritious and perfect for any time of day.